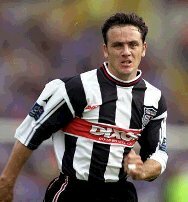 IN an exclusive interview as part of The Fishy's new "Slipped Through the Net" series, Richard Lord caught up with David Smith to talk about his time at Blundell Park. How did your move to Grimsby materialise? I was at West Brom and had been playing up until a few weeks before the move to Grimsby. There was a change of manager at West Brom and I got called into the office where the board had sanctioned a move and the manager had agreed to it so he said it was up to me if I wanted to move on. What was it about Grimsby that tempted you? I had worked with Alan Buckley before so I knew all about him. He said to me that the club was on the up and I'd be playing regularly. It was a longer contract than the one I was already on so that gave me some security. As a whole package it was more favourable than what I was doing at West Brom, where I didn't know whether I was going to be playing week in, week out. What do you remember of your Mariners' debut? The first few days were a rush. You go in and meet everybody - I knew a lot of the players there anyway - and then back to the hotel. The game.. I remember the game well because I thought Daryl Clare played really well that day. And what about that goal? Yes, I don't think you can really forget it! It was nice to start my Town career in such a good win for the club and, on a personal note, a good goal by myself. What was the competition like between yourself and Kingsley Black? I still see Kingsley now. He's one of the nicest people you'll ever meet. The competition wasn't necessarily between just me and him, but it happens at football clubs. It's one of those things. People who become friends over time may also end up being the people vying for the same position on the football pitch. We got on really well, we still get on well. How surprised were you that Grimsby achieved so much during your time there? The money side of things five years ago wasn't as much of an aspect as it is now. Smaller clubs like Grimsby could compete well with some of the bigger clubs. A lot of the players who were there were very passionate about football. Have you always been able to play at left back as well as left wing or was that something that developed at Grimsby because of the small squad? That developed from my mid-20s onwards. Where there any particular reasons why? There were a few injuries and I was thrown in at left back in an Anglo-Italian game. I did well and it opened a few peoples' eyes to say I could play there. When Alan (Buckley) was in charge I used on the left wing and at left back. When Alan left and Ray Harford took over I played solely at left back. Are you left-footed or right footed? So have you got a better right foot than most left-footers in the game? When I was a young boy I always practiced with both feet. That paid off throughout my career. I scored my first ever goal with my right foot so I always used it when I had to. Have you ever been forced to play on the right of midfield? I've played on the right for Coventry, Grimsby and probably for West Brom. Do you ever score simple goals or are all of them outside the area? Wingers are more often than not crossing. I tended to pick up balls that were on the edge of the box and I was always hitting them first time so a lot of the goals were strikes. A failing in my career would have been that I didn't score enough goals at the back post. I could have easily doubled my tally if I had been better in that area. What's your career total of goals? Not a bad total considering you played a few games at left back as well. Does it affect you when you suddenly have to revert to left midfield after playing defensively in the previous game? It probably takes you twenty minutes to re-adjust in regards to the pace and positioning. When you've played there for so long you usually just slip into it. You played in both positions at Wembley. What was that like? Just like any other game? Yes, just like any other game. They were two fantastic days. It was something that I possibly thought had passed me by, but then to come and do it twice in the space of a month it was great. Funnily enough, you don't remember as much as you would hope. You try to take things in but it all fades into one big blur. The one incident involving yourself that a lot of people talk about is that last-minute tackle on Mark Stein you made to force the game into extra time when it looked as though he was going to score. I remember that. He was running at me and took me away inside when I was expecting him to go outside so he caught me by surprise. I caught him up and managed to slide the ball away for a corner. If one thing stands out about Wembley, what would it be? Walking out onto the pitch for the first time. The noise, the fireworks going off; that was something. The celebrations at the end were good. I've been to Wembley a few times to watch and you wonder what it would be like to play. I don't know, when you do it just feels different. The pitch was absolutely fantastic. They were great times. The pitch is set in away from the fans at Wembley. As a wide player, did you feel detached from the fans or was the noise enough to remind you of how much pressure you were under? When the crowd are closer the atmosphere tends to be a bit more vibrant. Because it was Wembley and there were a lot of people there that day, it was noisy anyway. You never felt you were a long way away. What memories to you hold of your second season with the Mariners? I think a lot of the teams that come up via the play-offs tend to do well in their first season. We started off well and never looked back. We hit a bit of a blip after Christmas when we levelled off but a lot of that was to do with the length of the season before. It caught up with us in certain respects. Some of the players had played 68 games. In all fairness it was a great way to start in the First Division. Are there any special games that you can recall from that season? The West Brom game at home was a good one! You grabbed a goal in that match and a few others along the way, including a couple of fortuitous ones at QPR and Birmingham! Yes, one was off his (Ludek Miklosko's) head. What do you feel are your best attributes as a winger? I thought I always crossed the ball well and I worked hard for the team. I knew what the job was all about and I managed to adapt as the years went by to the changes in football. When I first played it was a case of getting yourself wide and getting the ball but after that you became more of a midfield player. As time went by you were expected to do the hard work in midfield and go wide to produce some magic. Did you enjoy playing at Blundell Park? Did you prefer to play towards the Pontoon stand in front of the Lower Smiths or towards the Osmond stand in front of the Main stand? We seemed to get a good head of steam up towards the Pontoon end for some reason. It was, in retrospect, slightly uphill. I don't know. It just felt that way. It didn't really bother me which side. The following season (99/00) was a bit frustrating for the team and the fans. Why was that? That was a case of cementing your place in Division One. We never looked like we were in trouble but then we never hit the heights of the season before. A few people moved on. You took a few penalties that season. You scored one against Palace and missed down at QPR. Was being the penalty-taker pre-planned? We'd had some problems with someone taking the penalties so before the Palace game the manager said "who's going to take one?" and then went "right, you can David". So I took it and it was no problem. The QPR one.. The keeper made a lucky save with his hip. He dived, but it hit him on the hip and ballooned over the bar because I hit it too hard. I should have scuffed it and it would have gone in! Had you taken penalties before? What was your record like? I had and I've never missed. I've never taken one since. I've taken one for Coventry in a league game against Sheffield United and I've taken one in a penalty shoot-out for Coventry. I took one for Grimsby in a shoot-out against Preston. What did Lennie Lawrence bring to the squad? He had different ideas on the way the game should be played. He brought some new things into training and what have you. He brought in a lot of new players through the loan system. I didn't play as much as I wanted to. That's football and everyone has their opinions. What were the foreign legion like? Was the language barrier a problem? Most of the spoke very good English. The only one who didn't was Zhang. You didn't get to play a part in the Liverpool win. How did you spend that day? I was at home. I had it on teletext and it was flashing up every time something happened. It was a great result. I mean, that season wasn't a great season personally for me because I was injured at the start and got myself into the side at the end only to hurt myself at Gillingham. That was the last game I played for the club, which was a shame because wherever I've played, I've enjoyed my time at Grimsby the best. Were you surprised that Groves was given the job as manager so soon? No, I know Paul really well and I think he will eventually go on to greater things. He's cut out for management. He's got a good knowledge of football and he's willing to learn even more. What do you put the 'Great Escape' down to? Team spirit. The Crystal Palace game was a good one for myself. There were a few 'must win' games from Christmas onwards and we managed to win them. I put that down to desire and team spirit amongst the players who have been there over the past four years. Do you remember your goal against Palace in that match? It took and age for Danny Butterfield to pull the ball back for you. I know, I thought the little so-and-so was going to shoot. Then you got injured in the Gillingham game, which ended up being your last appearance for the club. What happened from then on? It was obvious from the extent of the injury that I wasn't going to play again that season. Over the next few weeks it became apparent that that could have been my last game for Grimsby. In the summer I got a phone call from Nick Cusack asking me if I fancied going down there (Swansea). I went down to meet him, I went away on holiday to think about it and knowing that football wasn't in the best of states after the collapse of ITV Digital I decided that I should take up the offer rather than run the risk of not getting anything at all. Now you have been paid up. Was that due to Swansea's finances? Nick (Cusack) was replaced by Brian Flynn and I wasn't part of Brian's plans. He was bringing in a lot of new faces so he had to adjust his wage bill accordingly. Over the period of the last two or three months he let about six or seven of us go. It was a case of one in, one out. Did you play many games during your short time there? I played about four. All at left wing back and I scored in my second game. I started the season playing and then I hurt my groin for a week, then I didn't get back into the side and I was sub all the time. I'm probably going into the motor trade. It's something that I've always fancied. I've been doing a little bit on the side for a few years now. Funnily enough I'm coming up in the next few weeks to work at VW Grimsby.